Apr - 20 | By: OMPA | no comments. S ourceOregon 2012 is here! There are 1,500 crew and professional services included in this year’s directory, reflecting Oregon’s growing resources to serve the commercial, film, television and interactive media production industry. Equally exciting is our switch to a larger, magazine size format, with articles, photos and information about what makes Oregon a valuable place to shoot. We think you’ll like it! A comprehensive directory of all the professional services in Oregon is an extremely practical resource for shooting in the state. Keeping producers abreast of a current list of crew and resources available is a big part of OMPA’s role in fostering a functioning production industry in Oregon. And because contact information changes and new resources arrive throughout the year, the entire directory is live on www.SourceOregon.com, where every lister can log in and add or change their own information. The directory is used to show what sets Oregon apart, and includes stories about our locations, ease of permitting, technological savvy, production and post production resources. 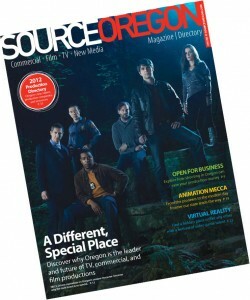 In addition to distribution to the working crew, production companies and projects currently shooting in Oregon, the directory is distributed as a marketing piece to agencies and production companies throughout the U.S. In addition to being a resource for coordinating our local industry and marketing Oregon’s resources to the world, SourceOregon is also where we publish the industry’s Standards & Practices, which includes suggested terms and best practices for client billing, employing children and working as an independent contractor. While the total dollars spent in Oregon’s industry is not yet known, we do know that the film and television component (ok, mostly television) is 177% greater than in 2010. That’s a lot of increase! Thank you for being a functioning community to accommodate that growth with professionalism and grace. And thanks for using SourceOregon to stay connected.